Last week I was in a bit of a quandary about fabrics to use for the latest border on my Down the Rabbit Hole QAL, I posted various options and ideas and had lots of really helpful comments and suggestions which helped me finally make my mind up! 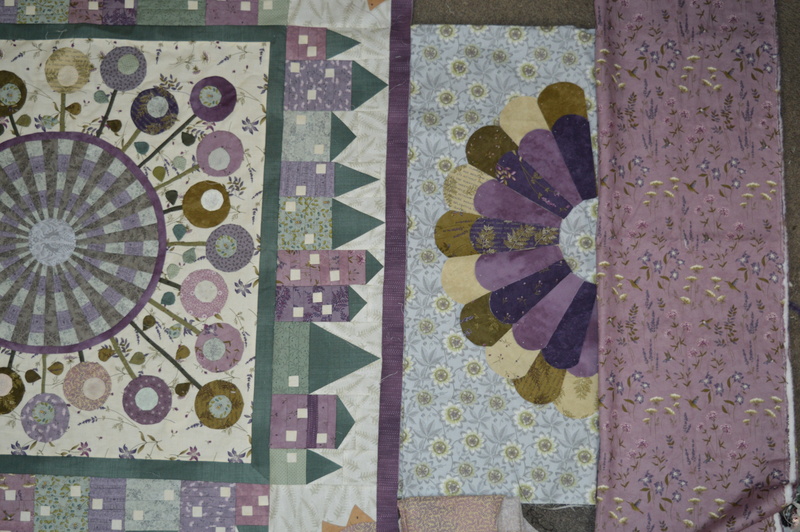 …I felt it was too contrasting and dominating with the rest of the quilt. There were a few people who suggested my background fabric might be more of the issue, too fussy, I did contemplate it for a while, but knowing my fabric choices for the outer border, I think it will help bring it all together. It brings together the soft grey in the centre circle and the silver grey rabbits that are going to be hopping round the edge. It’s also got the touch of olive in the rest of the quilt. I cut out wedges from lots of different fabrics, trying various combinations, as soon as I tried the mid purple with the blue/green I knew I had one decision made. They both have what I call smudgy colour variations, so they look fairly plain against the passion flowers, without the colour block of a plain fabric. For the centre wedges I’ve chosen a lighter purple and light creamy gold, I’m hoping this will link up with the rest of the sunflowers which will be stitched into each corner next month. I was hoping in the very centre to use an olive green, but I couldn’t get it to work, however I think this one with a dark purple background and an olive branch works well. I’m stitching them all down now, I’ve finished two and I’m well on the way with the third one. My hand applique stitch definitely improved with the third one, practice makes perfect! Although this may also be due to stitching the first two on Friday night whilst sipping gin with my daughter! She’s home from uni for the weekend and we just sat and chatted, putting the world to right, drinking gin with elderflower tonic until midnight. I love those evenings just enjoying each others company. I’m linking up with Kathy’s Quilts for Slow Stitching Sunday, a celebration of anything hand-stitched. I’m also linking up with Quilts My Way for Quilter’s Monday, why not follow the link and see what everyone else has been stitching. 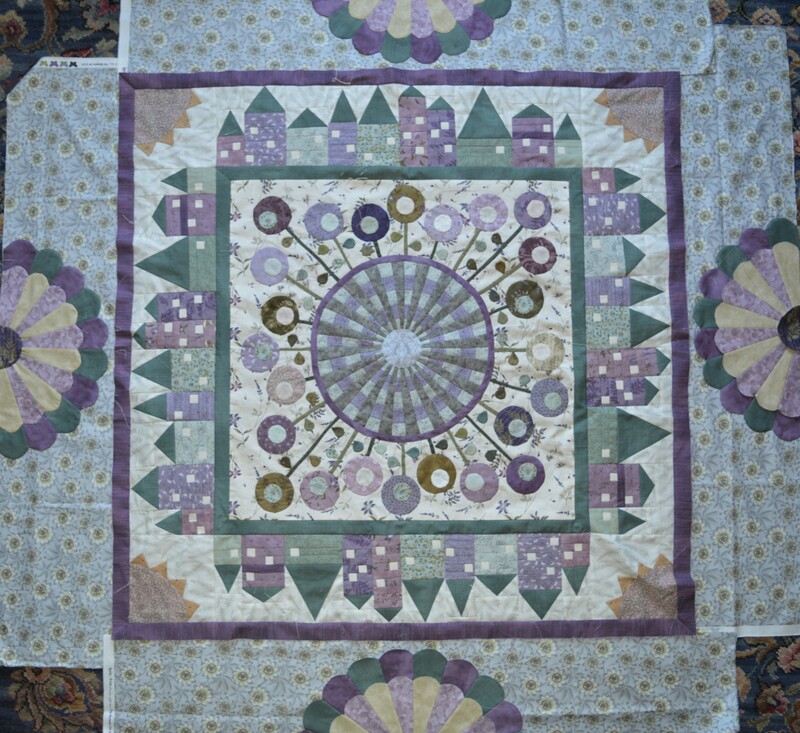 This entry was posted in Down The Rabbit Hole, Quilting, Serendipity and tagged #downtherabbithole, applique, Down The Rabbit Hole, Dresden circles, Quilting. Bookmark the permalink. wow! looking wonderful, and you’re right, the background fabric for this section is lovely too (I was wrong lol). It looks great, and I’m so glad you didn’t change the background. The purple centres work well too, having impact without standing out too much and throwing things out of balance. Thanks Kate, to be honest I don’t think there was ever any chance of the background changing, I really didn’t want to buy yet more fabric and I like it! A plainer background would also have made the dresdens even more dominating. 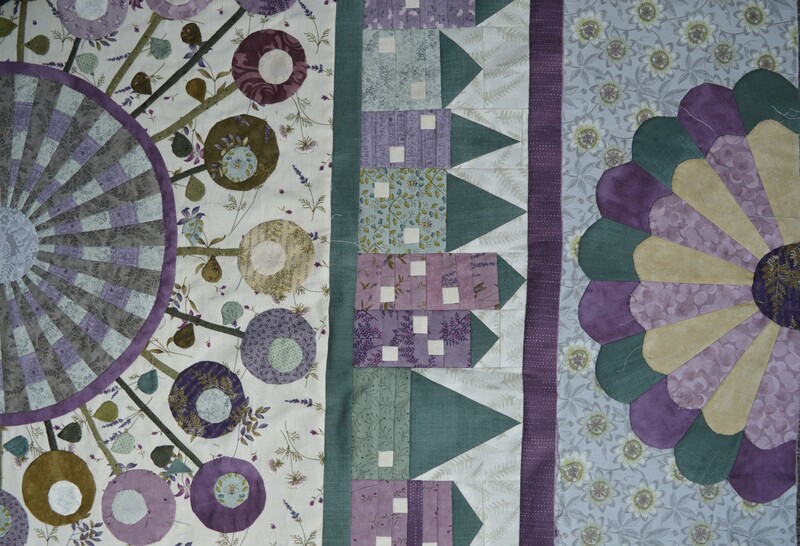 The Background is perfect and the muted colours in your Dresden plates look wonderful with the rest of the quilt. This quilt is stunning. Thank you Gail, I’m pleased with it so far! I think you made the right decisions. 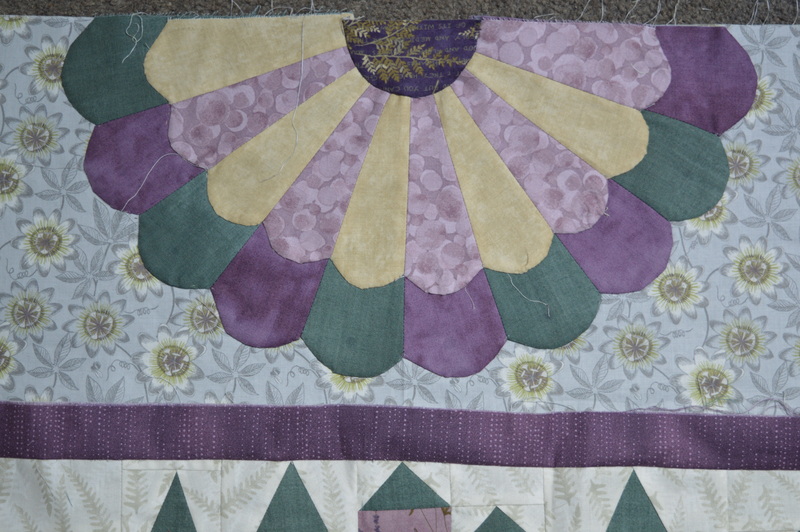 The background fabric ties everything in and your applique is so pretty. Thanks Cathie, it took a while but I got there in the end! Definitely the right decision. I lost my mojo for about ten years once because I tried to make myself finish a project that I didn’t love. It’s still a UFO to this day. Thanks Carole, there’s no point spending so much time and effort if we don’t like it, I’ve got lots of UFO’s too! That is stunning, love your final choices. it looks Gorgeous!@! glad you made your own decision about how it should move forward!! LOVELY!! It’s stunning, you definitely chose the right colours. Thank you, I’m happy with them. Oh yes. . . you picked out the perfect fabric. It is so satisfying. LOVE, LOVE, LOVE the final combination! You found the perfect combination of colours, and fabrics! So glad to hear you are noticing an improvement in your applique… maybe there is hope for me?!? I smiled reading about “putting the world to right” while enjoying lovely drinks and conversation with your daughter…that’s just the best! I want this pattern. She now has a book out, waiting to see how much the shipping would be. Expensive! Your colors are exceptional!!!! !